When used without any parameters, uptime works but gives only the ... uptime. However, when used with /a or /s, it crashes. Do you know a similar program that display also the "key system events and statistics"? The System Event Log gives information on when it goes to sleep but not more. I'm running Windows 7 Ultimate 64-bit, if it matters. PSInfo returns, in amongst everything else, uptime. PSLogList in the same group will dump the even log. Forgot to add: All of the SysInternals tools are very good. Many are quite useful, especially for Unix-ish people looking for focused tools to get fairly specific information, ofetn command-line or command line compatible. Get to all of them at http://www.sysinternals.com (which will be redirected to the deep page in Microsoft's site). That one doesn't show system bootup or shutdown but it shows application crashes, system crashes, installed software and updates, etc. If one gets a reasonable idea what exactly is a "key system event" for uptime.exe then it's probably not hard to recreate with PowerShell. net stats workstation | find "since"
This is probably unrelated, but if you open Task Manager, under the Performance tab, and the System group at the bottom, "Up Time" is listed in Days:Hours:Minutes:Seconds". Not sure if any application exists that does the type of Auditing you want, you can check the Event Viewer, it may do just that, but i'm not sure. Not the answer you're looking for? 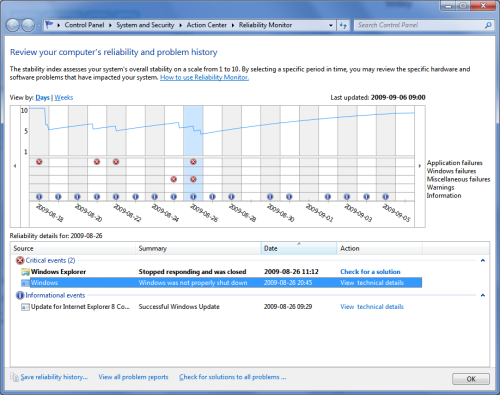 Browse other questions tagged windows-7 64-bit crash uptime or ask your own question. What's Keeping My Computer Awake? How to prevent UPS from waking up computer through USB?